An event was held just prior to the announcement of the host city for the 2020 Olympic and Paralympic games. Candles with handwritten messages from 2020 amateur runners were arranged to form the message “WE BELIEVE TOKYO 2020”, to form a work of art communicating our strong desire to host the games in Tokyo. The event was timed to make the most impact in advance of the announcement of the host city. Media from both within and outside of Japan were invited to cover the event, as a way to showcase our commitment and dedication as a potential host city. In order to maximize potential for exposure, especially with foreign media, the event was held with the Tokyo Tower and Zojoji temple in the background. 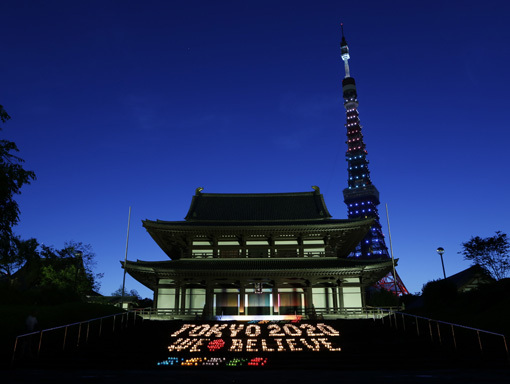 Both structures were lit up in the Olympic colors, and candles were arranged to form the message “WE BELIEVE TOKYO 2020”, communicating the city’s strong desire to host the games. The perfectly orchestrated layout which included all the elements in one frame, led to coverage in media as far away as Argentina, where the IOC voting took place.